London Inspector Video Slot Guide & Review - Casino Answers! London Inspector is a 5-reel, 25-line video slot developed by Realtime Gaming, featuring a stacked wild substitute symbol, scatter wins, multipliers, a free spins feature and a progressive jackpot. You can play the London Inspector Real-Series Video Slot casino game at US-friendly online casinos Cherry Red Casino and Aladdin’s Gold Casino. London Inspector is loosely based on Sherlock Holmes, who is a fictional detective who started appearing in stories in the late 19th Century. Symbols on the London Inspector slot game include Sherlock Hol — er, the London Inspector, his hat, a lantern, a badge, a magnifying glass, a watch, and Ace, King, Queen, Jack, Ten and Nine symbols. During spins on the London Inspector video slot, a 19th Century detective-style track will play. Bets on the London Inspector video slot game are $0.01, $0.02, $0.03, $0.04, $0.05, $0.06, $0.07, $0.08, $0.09, $0.10, $0.25, $0.50, $1, $2.50 and $5 per line. You can bet 1-25 lines per spin on the London Inspector slot machine. London Inspector is a penny slot, so you can bet anywhere from $0.01 up to $125 on a single spin – a good betting range. For those who wish to manually stop the reels, hit “Stop” to activate the skill stop feature. To play the London Inspector video slot, hit the “Spin” button. The highest paying symbol on the London Inspector slot game is the Hat symbol. If you hit 5 of a Kind of this symbol in London Inspector, you will win the 4000 coin top jackpot. Also, the Lantern symbol will pay out up to 1250 coins for five symbols on a selected payline. The wild substitute symbol is the Watch symbol. The Watch symbol will substitute for all symbols in London Inspector except for the London Inspector scatter symbol. The wild symbol is stacked and can appear on multiple positions on a reel. 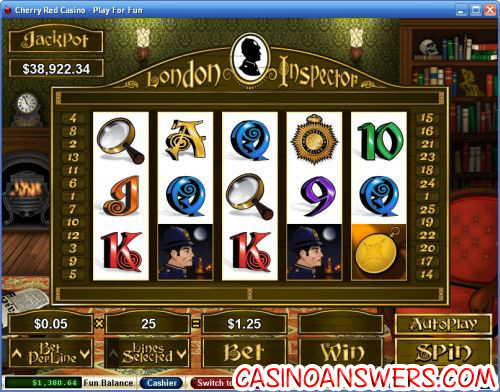 The scatter symbol on the London Inspector online casino game is the London Inspector (or Sherlock Holmes) symbol. 3, 4 or 5 London Inspector symbols will pay out 2X, 10X or 75X your total bet. In addition to being awarded scatter wins, you will also trigger 5, 10, or 15 free spins respectively. Prizes are tripled during the free spins feature. During the free spins feature, the video slot’s background will change to show the foggy streets of London. The free spins feature can be re-triggered. The London Inspector video slot is host to a progressive jackpot, which is currently at a tremendous $39,000 at the time of this writing and ripe for the picking. The Progressive Jackpot can be won at the conclusion of any game. The jackpot is triggered randomly and is added to all other wins. To attempt to win this progressive jackpot, visit the excellent Cherry Red Casino! Hit the “Autoplay” button to open the autoplay settings on the London Inspector slot game. You will be able to set the number of spins, set it to stop when the jackpot is won, stop if a win exceeds or equals (any amount you input), stop on any win, stop if your balance increases/decreases by any amount you input and stop once the feature is triggered. You can stop London Inspector’s autoplay mode using the “Stop Auto” button. To speed up the gameplay, simply hit the “Turbo Play” button in the autoplay mode. Wins on different paylines are combined. Scatter wins are added to payline wins. Payline wins are multiplied by the bet per line. Only the highest win is paid per line. Maximum win per paid spin is 50,000 times bet per line. If you’re a fan of the Sherlock Holmes stories, recent movie with Robert Downey, Jr. or if you just like the theme of the video slot, London Inspector is definitely a video slot worth playing. To play the London Inspector video slot and get an large enough bonus that you might think Sherlock Holmes will be hunting you down, sign up and make a deposit today at Cherry Red Casino! Can players based in the USA play London Inspector for real money? Yes, players from the United States of America are welcome to play the London Inspector slot game for real money or for free at Cherry Red Casino and Aladdin’s Gold Casino. For full details on Cherry Red, you can read our in-depth Cherry Red Casino Review. How do I trigger the London Inspector progressive jackpot? The progressive jackpot on the London Inspector slot machine is randomly triggered, so all you have to do to win it is simply play! Can I win big on the London Inspector video slot? Besides the progressive jackpot, there are other big wins you can take home on the London Inspector slot game! To read about some of ours, please read the My Biggest Online Casino Wins blog at Dan’s Casino Blog. Is there a free Flash game of London Inspector available? Unfortunately, London Inspector is not one of the online Flash slot games available at Cherry Red Flash Casino or Aladdin’s Gold Flash Casino. However, many other Real-Series Video Slots are available, including Aztec’s Treasure, Caesar’s Empire, Cleopatra’s Gold, Derby Dollars, Goldbeard, Lion’s Lair, Mister Money, Raindance, Red Sands, Ronin and Tiger Treasures. What casinos have detective slots?